International Journal of Research in Health Sciences,2015,3,1,118-125. 1-Assistant Professor, Department of Ophthalmology, 2-Assistant Professor, Department of Community Medicine, Tagore medical college and hospital, Chennai, INDIA. Introduction: Cataract is one of the most important causes of childhood blindness. Early intervention is necessary for good visual prognosis as this age group is prone for deprivation amblyopia. AIM: To study the morphological pattern and presentation of patients with congenital and developmental cataract and to study the visual outcome after cataract surgery in this group. To study the post-operative complications and the visual outcome after Yttrium Aluminium Garnet (YAG) laser capsulotomy and surgical capsulotomy in patients with posterior capsular opacification (PCO). Materials and Methods: Fifty children who presented with developmental cataract in the age group of two to twelve to the tertiary eye centre were included and followed up for one year. Extracapsular cataract extraction (ECCE) with primary Intraocular Lens (IOL) implantation with primary posterior capsulotomy (PPC) with anterior vitrectomy was planned for children aged less than six years and ECCE with primary IOL alone was planned for children aged greater than six years. Post operatively children were reviewed at regular intervals for the first year. Patients who developed PCO underwent either YAG laser capsulotomy or surgical capsulotomy. 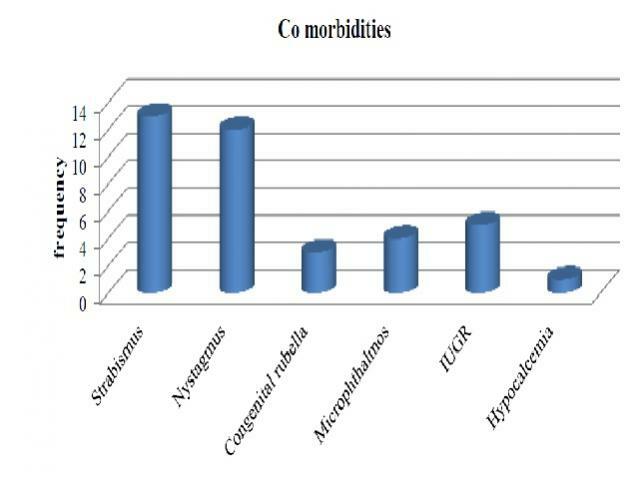 Results: Commonest type of cataract was total cataract followed by lamellar cataract and 92% were bilateral cataract. There was good visual gain after cataract surgery with post-operative vision greater than 6/24 in 44.3% at the end of one year. PCO was thick enough to require capsulotomy in sixteen eyes. Other than PCO, uveitis, pupillary capture, IOL decentration and glaucoma were the complication that was noted. Conclusion: This study shows a good visual outcome in paediatric cataract following IOL implantation and also PPC with anterior vitrectomy. Hence there is a need for early intervention for good visual prognosis in childhood cataract.